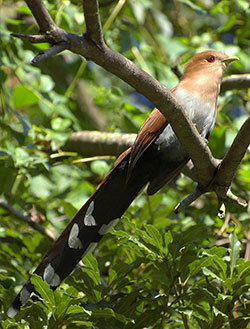 Squirrel Cuckoo, Piaya cayana: one of many birds fluttering around Tequila Volcano. Photo by Dario Sanches, courtesy of Wikipedia. 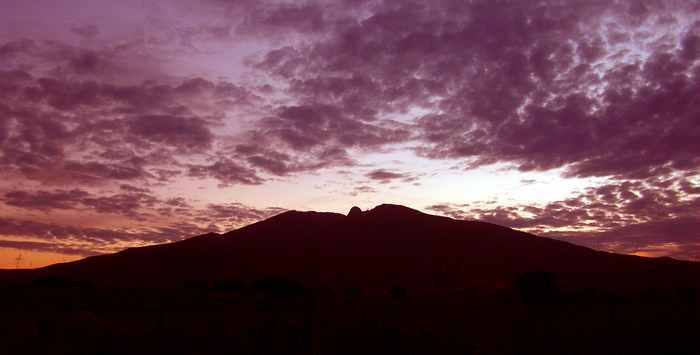 Tequila Volcano's “tetilla” or volcanic plug is the solidified remains of the volcano's last eruption about 200,000 years ago. Rising to a height of nearly 3000 meters, it offers a dramatic and unique view to those who scale it. Photo by Chris Lloyd. 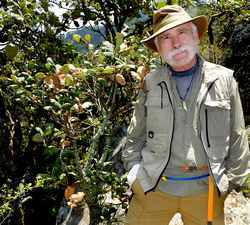 Miguel Mayorga of Zapopan pauses alongside a stunted clethra tree at the base of the volcanic plug. At nearly 3000 meters altitude, many normally tall trees appear like bonsais. 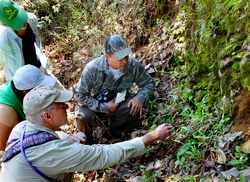 Julio Alvarez, center, discovers a collections of butterworts or mountain violets (Pinguicula). The Pinguicula is a carnivorous plant which digests small bugs that stick to its leaves. 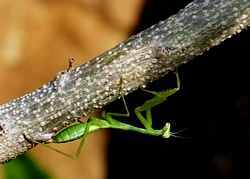 A young praying mantis seen during the two-kilometer hike from the parking spot to the base of the “tetilla.” A rich variety of flora and fauna await visitors to Tequila Volcano. Was the hike fun? "Sensational!" say Lucia and Mauricio Topete. Mexican documentary producer Alberto Fuentes recently announced plans for a TV series featuring natural outdoor attractions within “The Magic Circle” around Guadalajara, an area including all of Jalisco, Colima and Aguascalientes, plus parts of other Mexican states. According to El Informador, Mexico's cultural TV channel 22 recently announced plans to film the pilot for the Magic Circle series, focused on one of Jalisco's most famous landmarks, Tequila Volcano. On July 17, 2016, I led members of Fuentes' support team in a preliminary visit to the volcano for scouting purposes. We found the old road to be “not in the best shape,” with plenty of baches (potholes) but not worse than many another Jalisco camino. I would say any vehicle with good clearance can get up the volcano without a problem. 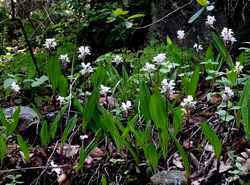 Our expedition made a stop at altitude 1500 meters where oak trees and black cedars abounded and a playful squirrel cuckoo frolicked overhead. From this point onwards, bunchgrass becomes more and more prevalent. At a distance of 10.5 kilometers from the train station—altitude 2000 meters—the trees are much taller as they compete for light. Among them is Pinus devoniana, which produces extraordinarily long pine cones. 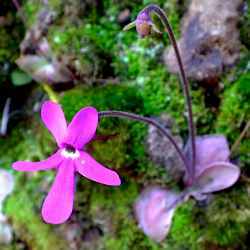 On the roadside, biologist Julio Álvarez spotted a number of butterworts or mountain violets (Pinguicula), a very curious little carnivorous plant whose leaves grow flat on the ground and are covered with a sticky substance which traps and then digests small insects. Further on, among the leaves, lay bright yellow Amanita mushrooms, which, our biologist informed us, could be edible, poisonous or hallucinogenic. These in particular, turned out not only to be edible, but they were later identified as Caesar's Mushrooms (Amanita caesarea), so called because they were a favorite of the Roman Emperor Claudius. In Spanish they are known as Yema de Huevo, Egg Yolks. At a distance of 15.7 kilometers from the Tequila Railway Station, our car ride came to an end in front of a locked gate with signs warning “private property.” Authorities in Tequila, however, informed me that this gate is “only meant to stop cars,” due to past problems of vandalism of the antennas. Hikers are allowed to proceed. During the hike, our birdwatchers spotted—among others—a spotted towhee, a slate-throated redstart and the unusually large magnificent hummingbird. At this altitude (2700 meters) the road may suddenly be shrouded in fog as a cloud passes by. 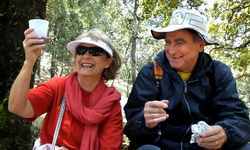 We all found this fascinating, an experience you can only get on a high mountain like this one. 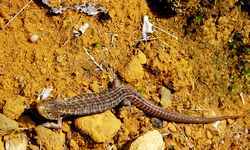 Those who were not used to higher altitudes found themselves huffing and puffing, but we were in no hurry, stopping again and again to photograph flowers or little creatures like a praying mantis, a millipede and a truly curious Popocatepetl Alligator Lizard (Barisia imbricata). After a walk of 1.5 kilometers, we came to a trail on the left (at N20.78951 W103.84820). Follow it uphill and you will find yourself perched on the crater rim, with the tall volcanic plug, popularly called La Tetilla, looming above you. 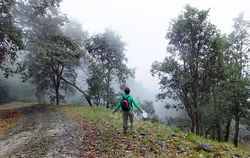 The trail—hard to spot when covered with leaves—heads east and then southeast for 694 meters, plunging you into a phantasmagorical landscape quite unlike what you would expect to see inside a crater. The bunchgrass now dominates and all the trees are “natural bonsais,” some barely two meters tall. 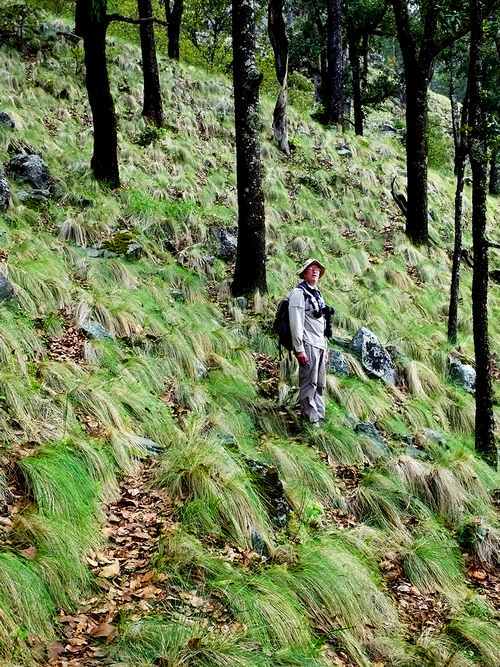 Here you'll find St. Benedict's Thistle (Cardo Santo), large Guadalajarana agaves, and a cypress tree which grows only on this volcano...and if you are lucky you may come across a rare Govenia purpusii orchid growing on the ground. 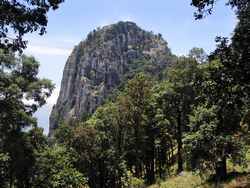 Belayed by a good mountain climber, most people can scale the plug, popularly called la tetilla to enjoy the reward of a 360-degree view of western Mexico from altitude 2920 meters above sea level. On a clear day, the agave fields, stretching off into the distance, looking for all the world like blue-green lakes. 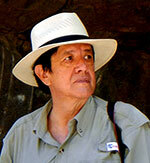 Producer Alberto Fuentes hopes to capture the uniqueness of Tequila Volcano on film, with the help of aerial photography, but no movie could do it justice. So, if you're reasonably healthy, you may want to add Tequila Volcano to your bucket list. There's no substitute for the real thing. Take libre highway 15 west from Guadalajara. As you approach the town of Tequila, turn south onto a street called Filosofos (at N20.88048 W103.82908). From here use Google Maps to guide you to the start of the cobblestone road (at N20.87231 W103.84263). Drive uphill 15.7 kilometers to the locked gate (N20.79208 W103.85348) and park. After hiking up the road 1.2 kilometers, you'll come to a crossroads. Take the right fork and after 400 meters, at N20.78951 W103.84820, you'll see the trail head on your left. 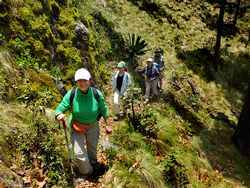 You'll find this trail, which takes you across the crater to the base of the plug (N20.78796 W103.84310), on Wikiloc.com under “Magic Circle 001.” Driving time from Guadalajara to the parking spot: about 90 minutes.